Awards of the hotels which are determined according to the results of the surveys applied by Coral Travel to its 183 thousand customers that the company has provided accommodation in 27 countries in 2013 have been granted in the held premiere night. 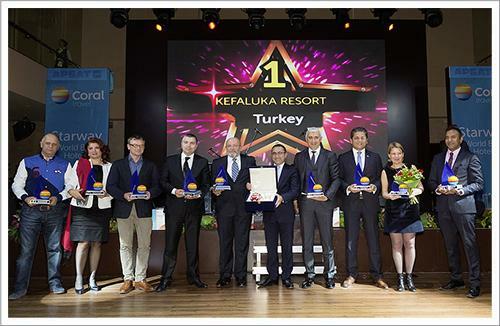 6 of first 10 hotels were from Turkey and KefalukaResort (Turkey) has won the first prize of ‘Starway World Best Hotels 2013’, Barut Lara (Turkey) has won the second prize and Magic Life KalawyImperial (Egypt) has won the third prize. Çoşkun Yurt, Vice President of Board of Directors of OTI Holding and General Director of Coral Travel, has stated related to ‘Starway World Best Hotels’ awards in the premiere dinner that “We pay great attention to the improvement of the services that we offer to the tourists. We apply customer surveys regularly for the last 12 years. Tourists make real assessmenst by expressing good and bad sides of the services that they receive against the money they pay".